Whenever people talk about Sonic The Hedgehog, one name invariably comes up: Yuji Naka. Perhaps it’s been the perception conveyed by the press over the past two decades, or maybe it’s just a lack of public interest for knowing the full story, but everyone seems to think that only one man was responsible for the character that changed gaming forever back in 1991. In fact, so engrained in the public mind is the myth that Naka was the sole creator of Sega’s famous mascot that gamers are often unable to name anyone else involved in his creation. That’s a shame, because by doing so they’re overlooking a team of immensely talented people that worked closely and feverishly to produce the most important title in Sega’s history. Most notable among this team was a man who is just as responsible, if not more so, than Naka for making Sonic who he is today. Truth be told, without the creative genius of this man, not only might the Blue Blur have never seen the light of day, but many of Sega’s most beloved classics might never have come to be. That man is Naoto Ōshima. Naoto Ōshima was born in Japan on January 26, 1964. Reportedly, He studied at the University of Tokyo, and eventually, he found his way to Sega of Japan in 1987, where he was hired as a designer. Ōshima’s first project was the mighty Phantasy Star for the Master System, where he worked his design magic alongside other Sega Stars Rieko Kodama (design) and Yuji Naka (programming), the duo with whom he would later make history. Naoto and his two colleagues hit it off and developed a rhythm that was pure Sega gold. They complimented each other’s work perfectly, working together towards a polished product that could hardly be identified by its individual parts. As a team, the trio helped offset any weaknesses in a particular area, with no interest in individual accolades. For instance, one story mentions Ōshima doing the character design for Phantasy Star’s Odin because Kodama felt that she wasn’t accomplished at drawing muscular men. This early effort led to work on other games like Space Harrier 3D and Spellcaster (again with Kodama). Ōshima was part of the group that moved from the Master System to the Genesis, and he found himself collaborating once again with Kodama and Naka, this time on the sequel to Phantasy Star, which was at the time the largest cartridge game ever made. This was to be the prelude to his greatest success at Sega, and the game that would forever etch his place in gaming history. With an excellent résumé of titles under his belt and a trusted position at Sega among its creative elite, Ōshima became part of a new group of fifteen people called AM8 (later renamed Sonic Team) that was tasked with creating a character that could topple Nintendo’s seemingly invincible Mario. 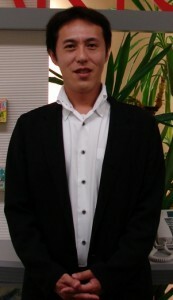 With Kodama and Hirokazu Yasuhara on designs and Naka helming the programming, Ōshima took on the task of coming up with the character itself. Close to two hundred ideas were tossed around by the development team until Sega settled on Ōshima’s hedgehog design, codenamed “Mr. Needlemouse.” Sonic The Hedgehog was born. Strangely enough, Ōshima’s next project was entirely in the opposite direction. After Sonic’s release, he worked on the MegaNet RPG Fatal Labyrinth, which saw a cartridge release in the west. Very low profile and released in the throes of Sonic Mania, Fatal Labyrinth went relatively unnoticed. Ōshima spent the next two years rather quietly, and he wasn’t part of the group that Naka took to the U.S. to work at the Sega Technical Institute. The game was critically acclaimed, but sales suffered due to the limited user base of the Sega CD. Despite this, the publicity generated by Sonic CD was was enough to secure Ōshima a limited role in two more Sonic related 16-bit projects, Knuckles Chaotix for the 32X, where he did the original character concepts, and Sonic 3D Blast, where he served as an advisor. It took a major shift in hardware for Sega to finally put Ōshima’s talents to work again, and when it did he delivered in a major way. Yuji Naka had returned to Sega of Japan to work on the new Saturn console, and he paired up with his old Sonic friend to work on a 3D aerial platformer called Nights: Into Dreams in 1996. Naka produced and programmed while Ōshima directed and provided the character designs. The game was a unique experience that enthralled Saturn owners, and the pair visited it again later that same year to create a token of appreciation from Sega to its fans in the form of Christmas Nights, which utilized the Saturn’s internal clock to provide a seasonal experience each time it was played. Bundled with several magazines as a giveaway, Christmas Nights was widely appreciated by Saturn gamers the world over. As a member of Sonic Team, Ōshima continued to innovate on the Saturn, with the under-appreciated racer Sonic R and the fan favorite Sonic Jam, a collection of the hedgehog’s 16-bit adventures (sans Sonic CD). His next title, Burning Rangers, gave players the role of futuristic firefighters that had to rescue citizens and defeat monsters across varied and dangerous locations. Ōshima took on a more complex role in its development, acting as director, character designer and graphic artist. Unfortunately, Burning Rangers was released in limited quantities at the twilight of the Saturn’s life span, and it has never been re-released or given a proper sequel. Ōshima’s final Sonic project, and his final Sega game as well, was one last spin (dash) with the character with whom he had most become associated. Sonic Adventure for the Dreamcast gave Ōshima his most different role yet, and he assumed several positions involving story event design and producing the movie cut scenes. 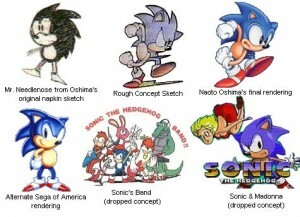 The game was a massive success and helped launch Sonic into Sega’s post-hardware era, and while the character no longer looked as Ōshima had originally designed him back in 1991, he was still the recognizable mascot gamers had come to know for almost a decade. Ironically, Sega would bring back Ōshima’s original design for the hedgehog’s twentieth anniversary title, Sonic Generations. The next decade was one of success and change for Ōshima. Eager to move in a new direction and wary of Sega’s sad financial state, he left the company shortly after Sonic Adventure was completed. He then founded Artoon in 1999. Artoon was among the few independent software publishers in Japan that weren’t directly tied to a publisher, and it assumed the rare position of embracing the Xbox. With his new company, Ōshima sought to release new and innovative games for all consoles, and he was heavily involved in the development of games like the Blynx series on Xbox, Yoshi’s Topsy-Turvy on the GameBoy Advance and Blue Dragon (with Mistwalker) on the Xbox 360. He recently lent his artistry to Away: Shuffle Dungeon (again with Mistwalker) on the Nintendo DS. Artoon was absorbed by AQ Interactive in 2010 leaving Ōshima to rethink his future once more. He has mostly been out of the public eye since Artoon disappeared, but he resurfaced in 2011 to reunite with his former Sonic Team colleagues to celebrate Sonic’s twentieth anniversary. 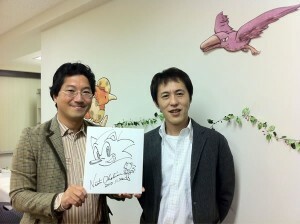 Ōshima was most recently seen visiting Naka and current Sonic Team head Takashi Iizuka for a casual get-together. Now that both Naka and Ōshima are no longer with Sega, speculation has begun to mount as to whether the duo will reunite for a new project. Given their track record, only great things could come from such collaboration. Di Costanzo, N. (1996). Sonic Team: The creators of Sonic and Nights. Hobby Consolas, 5(59), 43-44.